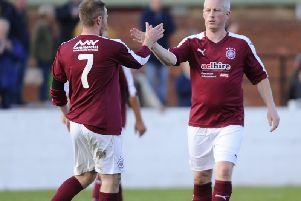 Linlithgow Rose boss Mark Bradley says Saturday’s win over Broxburn sets the standard he wants for the rest of the season. Bradley was delighted with a dominant display and a 3-0 victory which put the Prestonfield side back on top of the Conference C standings at their opponents’ expense. He said: “We were excellent, it was probably one of the better performances of the season. “They took a bit of stick the week before and we’ve taken stick as a team when we’ve lost other games this season. “But I feel it’s right that they get praise because every single person in the team put in a performance and we were the better team by a country mile. “We were totally dominant and in control of the game. That’s why it’s been a frustrating season because we’ve done it a few times, we’ve played with that tempo and standard but we kept it going for most of the game. 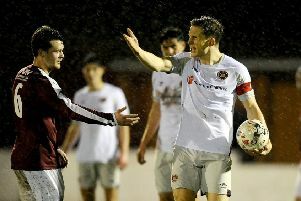 Rose have no league game this weekend but have two prestige home friendlies, against League Two side Clyde on Saturday and a Hearts XI - to officially open the new Prestonfield floodlights - on Wednesday.